1. Homeschool has always been in our future plans for K.
K is a great kid. She is smart. She is hilarious. She is friendly. She is also extremely trusting and innocent to the motives of other people and struggles with some aspects of social exchanges. K is a strange mixture of intellectually mature and socially immature, she knows and thinks and talks about things that are above the knowledge and interest level of most of her peers, but behaves in a way that is younger. She doesn’t always read other people’s cues appropriately and tends to get along better with grown-ups because they understand her and can also easily overlook her quirks. Kids are not as understanding. Setting her loose on a middle school campus where many of the kids are not so innocent or deserving of the kind of trust K gives so easily is not something we feel is a good option for her. While her brother has done great in middle school, we have known from the outset that this is not a good environment for K. It is too big and not nearly as closely supervised as her elementary campus. Everyone does NOT know everyone and the staff would not be able to look out for her the way they can at her current campus (it has been SUCH a blessing to have a staff that knows and cares for K). Okay, so that explains why we planned on homeschool starting in 5th grade, but what made us decide to start in 4th grade instead?? 2. This year has been a difficult year for K, socially. 3. Regular school is exhausting for K, homeschool will not have to be. 4. K will be able to explore enrichment opportunities for the first time ever. 5. Create a different kind of Individualized Education Plan for K! Like most kids, K has strengths and weaknesses in school. She started reading at 25 months and still reads at a much higher level than her peers, but she is not as strong in math. Homeschooling means that she can work on “grade-level” in math and at a higher level in reading. We can cut out busy work that is helpful for some kids but less so for K, we can exchange information orally to check comprehension when her hand muscles are too fatigued to write. We can use her natural interests to encourage her to work on the more difficult areas and approach subjects in an interactive manner that fits her personality and learning style more appropriately. We can go on field trips and take museum classes and all kind of new things! And can I just say that we will be happy to not have to worry about the STAAR test next year? The amount of anxiety that was created over that test (that she passed (math) and was commended for (reading)!) was a little insane this year. It isn’t why we are homeschooling, by any stretch, but it is a nice little perk. 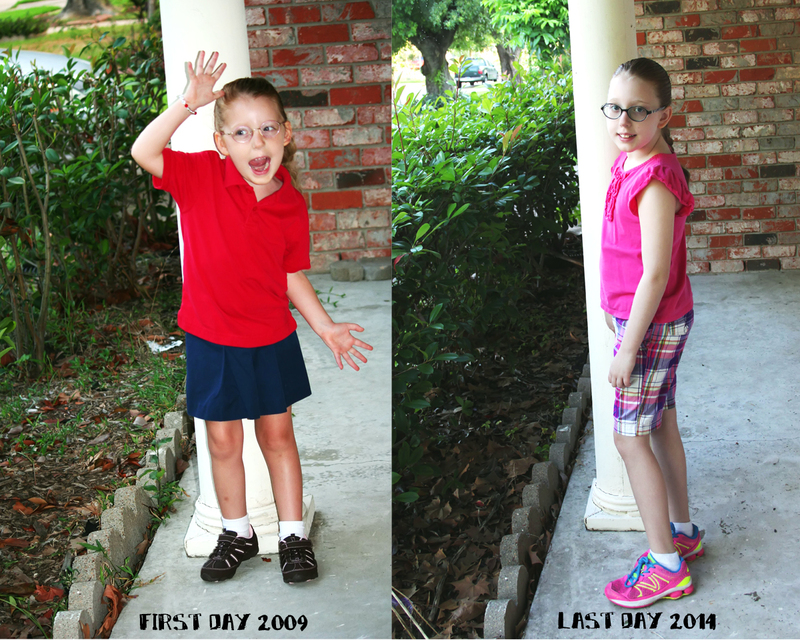 So, there is just a handful of the reasons that we are planning to homeschool K in the fall. I told Josh that it probably seems strange to some people that we are pulling her out when she is finally doing so well by academic standards. She was dismissed from her IEP and switched to a 504 at the end of the year (meaning her disabilities are no longer affecting her academic work), she no longer requires speech or occupational or physical therapy, and she is the healthiest she has been in years (perfect attendance TWO 9-weeks this year, insanity!). But when we look at the larger picture like this, it kind of seems like the perfect time to take her on this new adventure and see where it leads! She may return to regular school at some point, and we will leave that door open for sure. One of the many things K has taught us is that the future is predictably unpredictable and while we may make plans for things to go one way, they often end up going in a completely different direction! Our goal is, as always, to meet K’s needs in the best way possible and for this season, homeschooling seems the right choice…but life changes quickly and we will continue to be ready and willing to adapt as needed. So, with our best laid plans in place, here we goooo! If you are a teacher or staff member of K’s school and you are reading this, I cannot thank you enough for the years you have spent caring for my girl! Each of you have invested in her and supported her and loved her and made it possible for her to THRIVE in school and we have made so many wonderful memories with you all. On her first day of school there, drop off was so chaotic and I was so worried about my tiny, quirky, medically-complex kid that I drove away with tears in my eyes because I thought she was going to get lost in the shuffle and the thought of leaving her there was impossible, and yesterday as we drove away I had tears in my eyes because I know she was NEVER lost in the shuffle and the thought of leaving you all there and moving on to a new chapter is impossible. But I sincerely hope that we aren’t leaving you all there at all! Things are changing, but we hope that all of you will continue to be a part of K’s tribe for a very long time, in whatever new form that might take! Life with K is always an adventure, but the company sure has been a marvelous and unexpected gift from God! Thank you! It sounds like a lot of thought, prayer and planning have gone into this. I hope it goes fabulously welll!! It would be a shame to have K’s fire dimmed for too long. It sounds like it will be a great thing for you as a family to try this new adventure. Best wishes! Good Luck with home schooling. We started home schooling our 2e (actually 4e) DD recently and it has been a brilliant journey so far. My DD is a March 05 BBC kiddie so we’ve been following your blog over the years. Good luck with your new journey and if you ever want a private gifted forum to post on (lots of homeschoolers and 2e kids), just PM me. Best wishes for your new adventure with K.
Just stopped by to see if an update was posted. Praying all is going well.